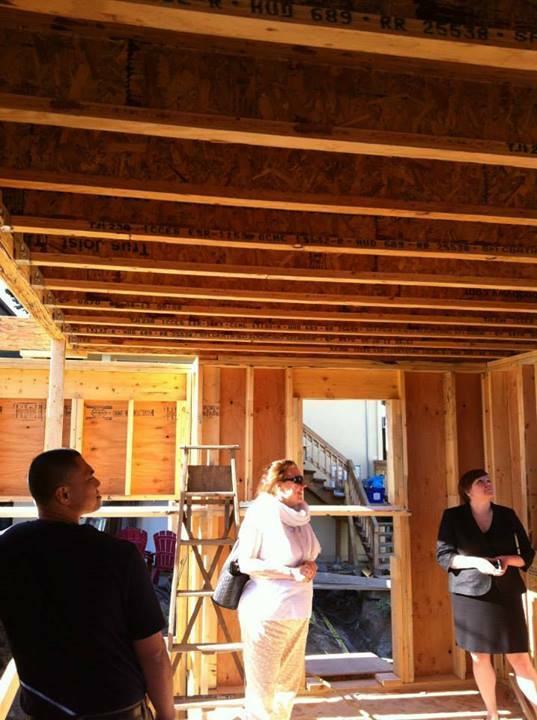 We had our semi-weekly meeting with Laurel and Angelito yesterday to check out the developments in our laneway home. We actually went inside to check it out, and we were just thrilled at every step. I actually squealed with delight. That shows the perimeters of the complete house. 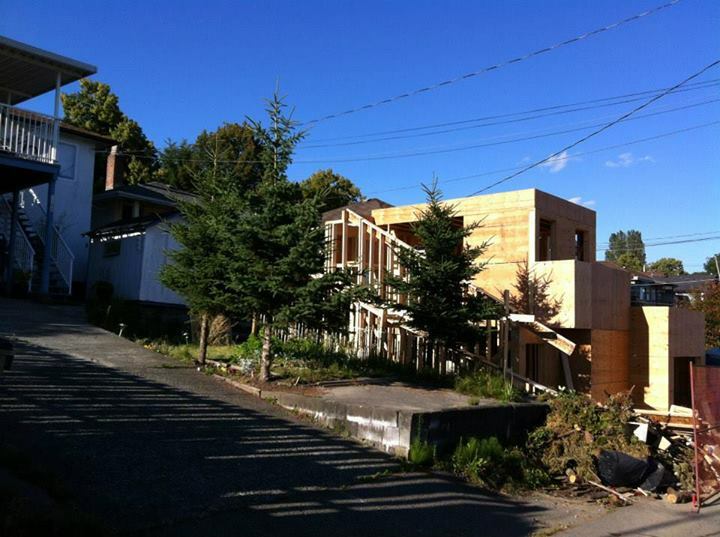 You can see that the top of the laneway doesn’t block a lot of the view from the main house’s deck, being about the same height as the house across the lane. We do block the view of their garage across the lane, and the Grizzlies backboard attached thereto. 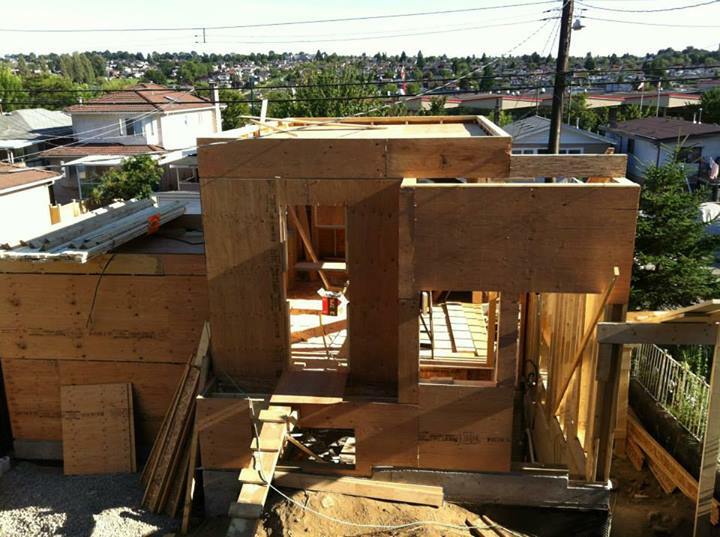 You can see how the house will be massed with the gable on the west, and the flat roof beyond. 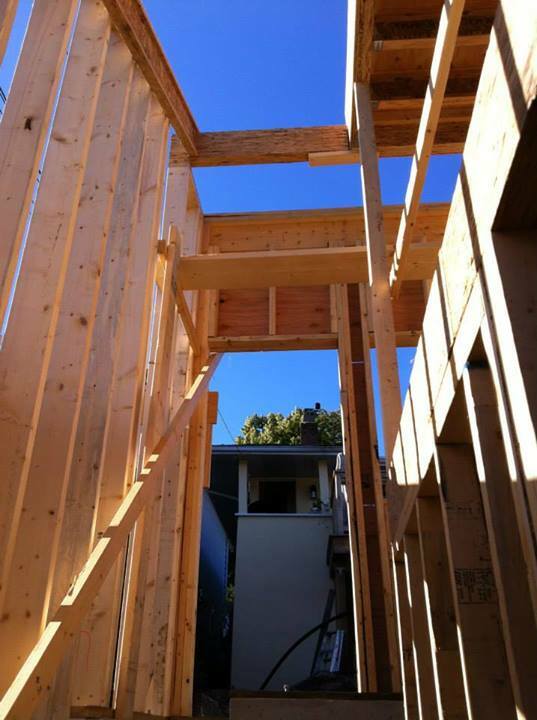 That top level will be the deck, the kitchen and the sitting area. There are so many design details you don’t notice in the building when you are looking at the plans. Like when you step in the front door on the lane you will see right through the huge window of the back door on the yard — and right up to the kitchen door of the main house. When we looked at the top floor from the outside, the room seemed very small. But when we actually stepped into the space we could see how the windows and the open plan seemed spacious and airy. That doorway in the back behind me will be part of the wall between the stove and the fridge, with just a small window. Right now it’s open to let people access the top floor since the stairs won’t be in place until the slab is poured. It’s so hard for me to imagine in 3D. I could see the plans, I could mark out the size of the rooms on my floors — but until you stand in the space you really can’t get the full concept of the home. We are even more excited to see what will come. After our tour of the laneway we ducked into the main house to see the developments of the basement suite. It all looks very nice, but I was blown away by the quality of the tile installation in the bathroom. It’s just a simple brick design of subway tiles, to be grouted with dark grout. The tiles wrap around the tub and onto the adjoining wall. Each tile along the ceiling had to be individually fitted to the imperfections of a decades-old house, and yet it looks fantastic! I’m toying with the idea of wrapping the tile along the wall with the window, the toilet, and the sink. I think it would look very nice. But it’s something I have to think about. Posted in Decorating, Laneway House, Small House and tagged Decor, Lane Home, Lane house, Laneway House, Small House, Small Style. Bookmark the permalink.